Sometimes, picking the right vacuum can seem as daunting as applying for the right credit card or purchasing the right insurance policy. But it doesn’t have to be. 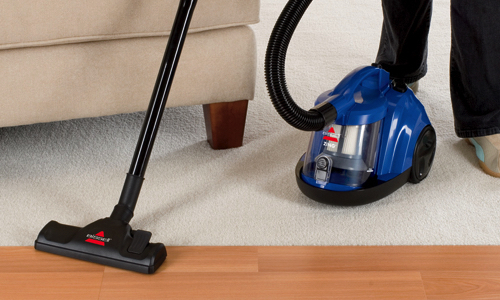 If you’re considering buying a canister vacuum cleaner, let us help make your decision a little easier. The Bissell Zing 6489 is a compact blue canister with a bagless dirt collection system and variable suction control for optimal performance on multiple types of surfaces. The Kenmore Progressive 21514 is a large white canister that boasts five attachments and on-handle controls for ease of use. But it’s not just weight and cord length that set these devices apart. The Kenmore is over $100 more expensive than the Bissell. We looked long and hard at each of these vacuums to declare which one is a better match for which type of consumer. NerdWallet takes you shopping: The Zing Bagless Canister 6489 will set you back just $49.99 from Bissell. At just 8 pounds, this device is as lightweight as it is versatile. Designed to function on carpet, upholstery, bare floors, stairs and low pile carpet, this canister features three-stage filtration for efficient dust pickup, a carrying handle for convenience, a bagless design and a 15-foot power cord. The vacuum isn’t lacking in extras, either. It comes with an extension wand and crevice tool/dusting brush. For more-delicate cleaning jobs — such as curtains — you can take advantage of the product’s variable suction control. Keep in mind that although this canister weighs less and boasts many of the same features as the Kenmore model, its power cord is considerably shorter. At just 15 feet in length, you might be plugging and unplugging the device often. Good fit for: The Bissell Zing works well for consumers who desire a lightweight and highly maneuverable vacuum for small cleaning jobs around the home. Since it’s relatively affordable, it’s also an ideal match for first-time canister buyers who want to test and see if this type of vacuum design satisfies their cleaning needs. NerdWallet takes you shopping: The Kenmore Progressive Canister Vacuum Cleaner 21514 is on sale for $199.99 at Sears; it carries a regular retail price of $299.99. This canister is intended for use on both carpet and bare floors. Plus, thanks to the device’s Stair Grip feature, it can tackle stairs while still remaining in an upright position. 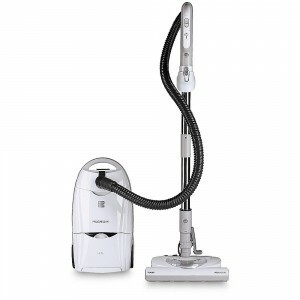 Additional noteworthy aspects of the Progressive include its two-motor system, retractable cord storage, 6-foot hose, four height adjustments, 14-inch cleaning path width and True HEPA-certified filter. Weighing in at 23.1 pounds, this device is considerably bulkier than the Bissell. However, it features a longer power cord (26 feet compared to 15 feet) and a number of pet-focused attachments. This Kenmore comes with a crevice tool, dusting brush/upholstery tool, bare floor tool, motorized Pet PowerMate tool and pet hair catcher tool. Good fit for: This multi-surface Kenmore canister is a perfect match for pet owners. 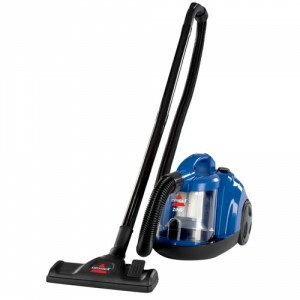 Its attachments and upright design mean you can take it anywhere in your home for practically any type of cleaning job. However, since this device is bagged, its buyers shouldn’t mind having to purchase replacement bags in the future. Images via Bissell and Kenmore.